A steeplechase, also known as “Jump Racing”, is a horse race over fences combining the raw power of the flat racing Thoroughbred with the precision and impulsion of high speed cross country jumping, creating a sport that is both thrilling and exciting to watch to fans and the uninitiated the world over. Steeplechase is an unusual word. Where did it come from? The steeplechase originated in Ireland in the 18th century as an analogue to a cross country thoroughbred horse race which went from church steeple to church steeple, hence “steeplechase”. The first steeplechase is said to have been the result of a wager in 1752 between Cornelius O’Callaghan and Edmund Blake, racing four miles (6 km) cross-country from Buttevant Church to St. Leger Church in Doneraile, in Cork, Ireland. 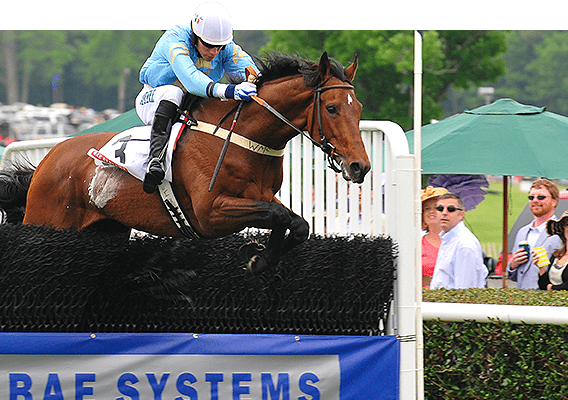 The first recorded steeplechase over a prepared track with fences was run at Bedford in 1810, although a race had been run at Newmarket in 1794 over a mile with five-foot bars every quarter mile. The first recognised English National Steeplechase took place on March 8, 1830. What is a Steeplechase horse? A steeplechase horse is a Thoroughbred, just like those that race at American racetracks on all over days. In addition to speed, the steeplechase horse must possess the ability to jump fences at a fast pace. They usually are a little older than the horses that race on the flat, and most of them have experience on the flat. 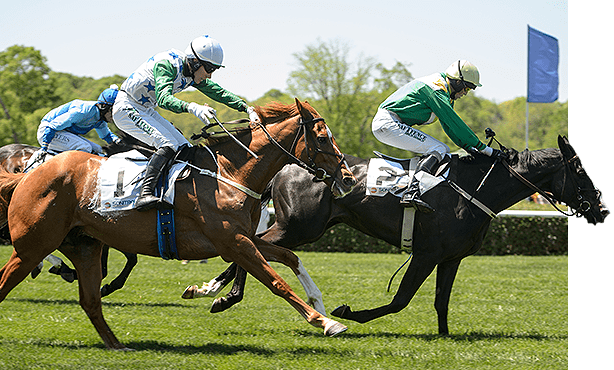 Because steeplechase races are longer than those on the flat, the steeplechase horse also must have enough stamina to carry its speed over two miles or more. Most are geldings (castrated) and are continuing their racing careers over fences. What is the most famous Steeplechase in the world? The most famous and toughest jump race in the world is the English Grand National, held at Aintree Racecourse outside of Liverpool, England. Run since 1839, the race consists of 30 fences made of spruce stuffed into wooden stakes. The race generally attracts 40 starters and is run over a 4 mile course where the horses and their brave jockeys negotiate the most testing of fences. The National is also the most watched television sporting event in the world. Who are the Steeplechase jockeys? They are a varied group. Most are professional riders, but some amateur jockeys remain in the steeplechase sport. Many of the leading jockeys today are from Ireland or England, where they gained valuable riding experience. Some women also are jockeys, and Danielle Hodsdon has been a champion jockey. Do Steeplechase jockeys have any special equipment? Yes. 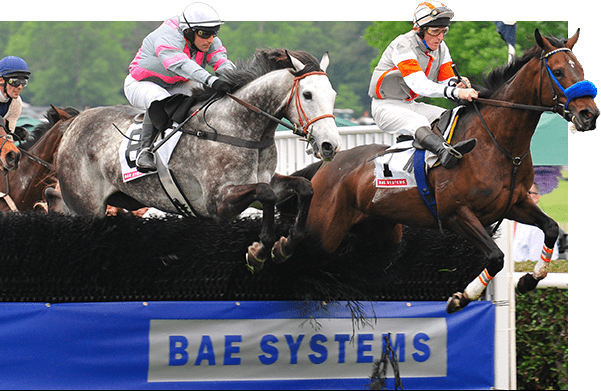 The National Steeplechase Association, the sanctioning body of jump racing in the United States, requires jockeys to wear certified helmets and chest protectors that meet stringent crash-protection standards, and they carry padded whips to protect the well-being of the steeplechase horses. Do Steeplechase jockeys also ride in flat races? In general, no. Steeplechase jockeys are taller and heavier than most flat jockeys. The weights carried by steeplechase horses are higher than those of flat runners, so the jockeys tend to weigh a bit more than their counterparts on the flat. What kind of fences are used in the United States? The fences used here in the USA are more like hurdles and are used in most races meets known as National Fences. They are portable obstacles that are used in steeplechase races up and down the East Coast, where most steeplechase races are held. The man-made fence consists of a protected steel stuffed with plastic birch, and a foam-rubber roll, covered with green canvas, on the takeoff side. Horses jump the fence in stride, much like human hurdlers in track and field events. The jumps are shipped to the race meets by a specially modified tractor trailer and are set up on turf courses in advance of the races. Other fences are timber fences, which are wooden post-and-rail obstacles, and a few race meets have natural brush fences. Are these horses prepared for races at the race track? In most cases, no. While most flat horses are housed in the stable areas of racetracks, steeplechase horses generally are trained in country settings. Steeplechase horses can be trained anywhere, but most of them are based on the East Coast between Pennsylvania, South Carolina and Tennessee. The country setting allows them to spend plenty of time outdoors, unlike horses housed at the racetrack. What is the sanctioning organization for American Steeplechase races? The National Steeplechase Association, Inc. is the governing body of American jump racing. It is based in Fair Hill, Maryland, and is responsible for licensing owners, trainers, and jockeys. It establishes the rules for the sport, and it also organizes the entries for races held at racetracks and at one-day race meets in the United States. What are the important things to know about tailgating at the Queen’s Cup Steeplechase Races? There’s a short list of Do’s and Don’ts that every patron should be mindful of. I see the Queen’s Cup MCP ‘Chase feature is a novice race. What is a novice? A novice is a horse in the early stages of its steeplechase career. Novice races, restricted to horses that won their first races over fences after a specific date, give these younger competitors valuable experience before they face more seasoned jumpers. The feature race, the Queen’s Cup MPC ‘Chase, sponsored by Sonitrol, is a race for Novices and carries a $75,000 purse with 60% going to the winning owner. 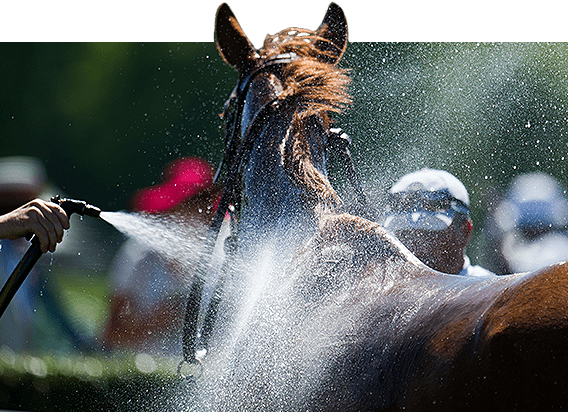 The steeplechase horse owners receive designated shares of the total purse money, and both trainers and jockeys receive a share of the owners portion. But the biggest winners are the communities where the races are held. American steeplechasing is unique because its races invariably support charitable efforts. The Queen’s Cup has contributed over $600,000 to local and regional charities since it’s inception.